Great work amd great list! Among the big games the Intercontinental Cup and FIFA Club World Cup should also be considered. The relevance given to those games in South America made the goal scorers almost legends in their teams. The Supercopa Sudamericana (1988 until 1997) and the Copa Sudamericana (since 2002) have at least the same value as the Europa League and the Cups Winners Cup. He probably means the second group stages. As it was in '82. Delaney is a hack. Great work Liam. Weighting IS important. Delaney is an excellent journalist. Liam's work is good but, for all your talk of weightings, he hasn't weighted when goals come, whether they're important etc. Delaney's does. I'd also agree that Delaney is an excellent author. I always enjoy his stuff, though these two comparisons are looking at different measurements. I believe this one covers more games as well - based on the names I've seen in Miguel's piece. No points for World Cup 3rd and 4th place play-off, which occurs after the semi-final? This is very interesting, but where is Maradonna? Didn't he crack to top 50? Liam, I feel you should have included the final of the World Club Championship in this. 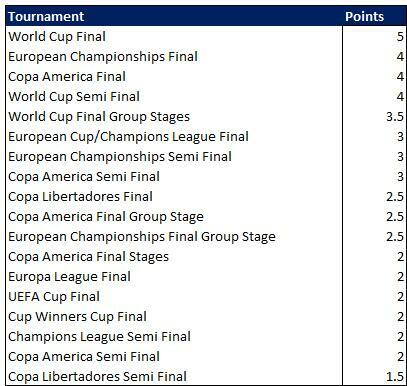 Messi has scored twice in it and the tournament is becoming more and more prestigious. Great work though, thanks! This list has a lot of potential, but i still think it's pretty inaccurate. Maradona's goal of the century or incredible goal vs Belgium in semi final shouldn't be valued less than for example Ronaldo's tap in in final of 2002 WC (first goal). Although Ronaldo scored in final, Maradona stepped up more individually in those moments. Also you can argue that teams they scored against make a big difference in importance of their goals, but that's nit picking.